KATHMANDU, Feb 4: The ongoing budget session of parliament, which began on May 3, has crossed 10 months without being prorogued. Though there is a tradition of proroguing the budget session once the full budget for the fiscal year is endorsed, the ongoing session has continued even after endorsement of the budget for fiscal year 2016-17. The Oli government resigned after the opposition parties registering a no-confidence motion in parliament. With the change of government, it took a few more months for the new government led by Pushpa Kamal Dahalto to get around to endorsing the full budget. Parliament endorsed the budget in September last year, but a move by ruling and opposition party lawmakers to register an impeachment motion against then chief Lokman Singh Karki of the Commission for Investigation of Abuse of Authority (CIAA) led to the prolongation of the House session. While parliament was taking months to decide about the impeachment motion, the government registered the election-related bills in view of the fast approaching constitutional deadline for holding local, provincial and parliamentary elections. The ongoing House session crossed 10 months on Friday, but this is by no means the longest session in Nepal's parliamentary history. The longest House session took place starting in 2011. Beginning from May 2, 2011, it ended on February 21, 2012, thus lasting for a total of 295 days. In 2006 also, a House session had continued for nearly 10 months . Starting on April 28 of that year, the session lasted till January 15, 2007. Parliament has also witnessed some very brief sessions. The shortest session ran only from January 13 to January 15 in 1999. Parliament was dissolved just two days after the commencement of the session. Similarly, a special session summoned in May 2015 a few days after the massive earthquake ended within six days. Minister for Law, Justice and Parliamentary Affairs Ajay Shankar Nayak has said that the government is planning to prorogue the House after the endorsement of one more election-related bill, which is currently under discussion at a parliamentary committee. “We are waiting to prorogue the House after endorsement of the Bill on Political Parties. 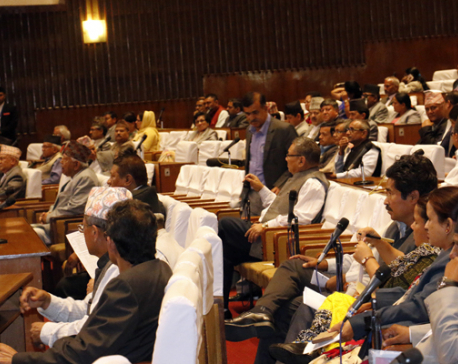 The constitution amendment bill can be endorsed in the next session as it is still being debated in the House,” said Nayak. Spokesman of the parliament secretariat Bharat Gautam said that the House has no major business except the bill related to political parties. “Commencements and prorogations of the House depend on the decisions of the government. As parliament has no say in such decisions, the government should be clear about these matters,” he said. Parliament generally has two sessions in a year, the budget session and a winter session. Once the budget session is prorogued after the endorsement of the budget for the fiscal year, the winter session holds deliberations on other bills.